June 25, 2012 Culture » Big Shiny Robot! The movies based on Marvel properties are on top of the world right now. The Avengers is one of the highest-grossing films of all time—not counting for inflation—and deservedly so. It combined a disparate group of characters against a fiendish villain and his plot to subjugate the world in a way that was smart, flashy and worth investing your time into. As a team, The Avengers was hardly the first group off the ground in the world of comics and was full of characters that would have been considered B- or C-list just five short years ago. Now, it’s the biggest thing in the world. But The Avengers were beaten to the world of comics—by a full three years—by DC Comics’ Justice League of America. 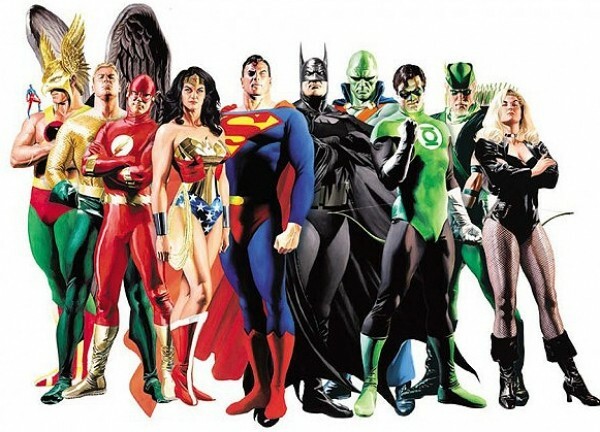 The Justice League consists of the most recognizable characters the world has ever known: Superman, Batman, Wonder Woman, Green Lantern and The Flash. It would seem like a no-brainer to put them all in a movie together. If not the entire Justice League, why haven’t we seen a movie bringing Batman and Superman together in a film? They’ve crossed over into one another’s comics so often it’s hard to keep track of how many times it’s happened. So why does it seem so unthinkable in the world of cinema? What is it that Warner Brothers (which owns DC) is doing so wrong that they just can’t get together and match the success of The Avengers? I’ll admit my motives are entirely selfish. I am primarily a Batman fan, but I have just as much fondness for Superman. One thing they’re doing wrong is canceling projects that will work. Did you know there was a Justice League movie in the works just a few years ago that George Miller (of Mad Max fame) was scheduled to direct? By all accounts, it was going to be a fresh take on the big-screen superhero film. Those who read leaked copies of the script sang its praises, but for reasons unknown, the plug was pulled. David S. Goyer wrote a Green Arrow movie called Super Max that sounds absolutely incredible: Green Arrow is incarcerated for a crime he didn’t commit and is put in a super maximum-security prison full of super villains he put behind bars. He needs their help to escape and clear his name. Sounds awesome, doesn’t it? But have they taken the leap to greenlight it? No. Another cancelled project that must sting Warner Brothers to no end is Wonder Woman. They hired Joss Whedon to write and direct, then, after months of writing and pre-production, they bought someone else’s take on the character and unceremoniously fired the director. Yes, that’s the same Joss Whedon who wrote and directed The Avengers. Then they have the abysmal Green Lantern film starring Ryan Reynolds from 2011. They hired a reasonable director, but seemed to forget they should hire a competent screenwriter and ended up with one of the worst superhero movies I’ve ever seen. They need to farm a brain trust of talent from DC Comics, with the best writers in the industry who know how to handle the characters best—Chris Yost, Scott Snyder, Bryan Q. Miller, half a dozen others—and let them decide the best ways to do that on the big screen, not some clueless studio executive. Then, they need to actually take risks on these movies and not cancel them. With the success of The Avengers and the multiyear plan on Marvel’s part to continue the success, DC better get its act together if it doesn’t want to fall too far behind the curve. Rumors are flying that DC is trying to get another Justice League film together and wants to offer it to Christopher Nolan (the mastermind behind the current Batman trilogy). But will it be too little too late?